When creating a cohesive design in the landscape it can be helpful to pick your color palette before you start. Color Theory is one way to create drama in the landscape using complementary colors. Complementary colors are opposite colors on the color wheel, such as blue & orange, purple & yellow, and red & green. Textural and interesting foliage offers a wonderful background to colorful flowers. Tecoma ‘Orange Jubilee’ paired with Juniperus x pfitzeriana ‘Glauca’ are a perfect complementary color pairing. 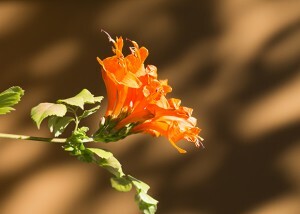 The beautiful deep orange trumpet flowers of the Tecoma ‘Orange Jubilee’ are complementary to the blue-hued free growing foliage of the Juniper. Both plants are extremely drought tolerant and sun loving, making this an even better partnership. make a delightful complementary bloom combination. The dramatic arching royal purple spires make a great backdrop for the bright lemon yellow flowers of the daylily. Both are reliable bloomers, so this pairing will provide beautiful complimentary color all summer long. As the seasons change, your garden’s color palette may as well. Pyracantha ‘Santa Cruz’ Is a versatile plant that offers its own complementary color combination. Cluster of white flowers emerge in spring and are followed by attractive red-orange fruit in the fall and winter. The striking berries are contrast nicely with its evergreen foliage. Pyracantha ‘Santa Cruz’ is a wonderful low sprawling shrub for dry areas that supports wildlife, especially birds. When looking to create complementary color combinations keep in mind the intensity of the colors you are working with. You can create complementary combinations using either the bold versions of your chosen colors, or pastel version. As with any landscape design, be sure to pair plants with similar water, sun and soil requirements. While some plants may look stunning together, they may not be the most practical for your landscape. 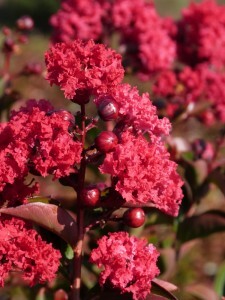 Waterwise, Tough and Gorgeous…Crape Myrtles!